Escape the city bustle of Buenos Aires for a full-day fishing tour. Get picked up at your hotel in the early morning and travel to the Parana River for a fishing excursion. 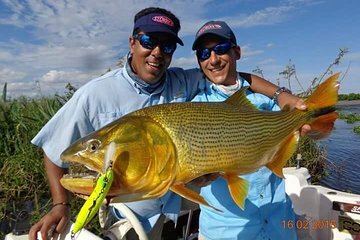 Climb aboard an 18-foot boat with two casting platforms to try your hand at catching a variety of fish such as Golden Dorado, Surubi, and Tararia. Relax on board with a picnic lunch and drinks. Practice catch and release due to a local conservation policy.